The term zashiki is a compound of two Japanese kanji, “za E(sitting, or to sit) and “shiki E(to spread, or put down), and generally refers to a room used for receiving visitors. Guests take their shoes off in the hallway, then sit on the floor on cushions, placing their feet in a space sunk under the table. 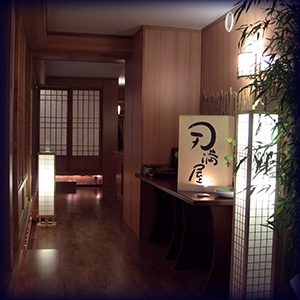 The rooms all have closable shoji doors and can be reserved for any size party. Call today to make a reservation or to ask about our customized course menus for larger parties.